Residents of other states may obtain a card with a $25 deposit and may check out no more than two items at one time. The $25 deposit will be refunded upon clearing the account and turning in the temporary card. 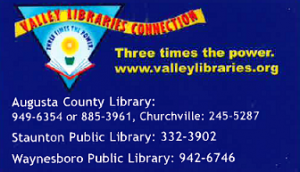 An Augusta County Library card gives you three times the borrowing power through a cooperative effort with the Staunton Public Library and Waynesboro Public Library called the Valley Libraries Connection (VLC). You can use your card at all five of the ACL locations as well as the Waynesboro and Staunton Public Libraries to check out books, movies, music, audiobooks, puzzles, puppets and more. Our catalog system shows the holdings of each library. You can place a hold on items at any location and and have them delivered to the location of your choice! Courier services run between the three main libraries each business day and to the outlying Augusta County Library branch and stations every week. Your library card allows you to use public access computers or to check out a laptop computer. Your library card also allows you to download digital magazines, audiobooks and ebooks for free and gets you access to online databases. You may return materials at whichever library is most convenient to you or to our books returns in Verona and Weyers Cave. Cards are valid for 2 years!